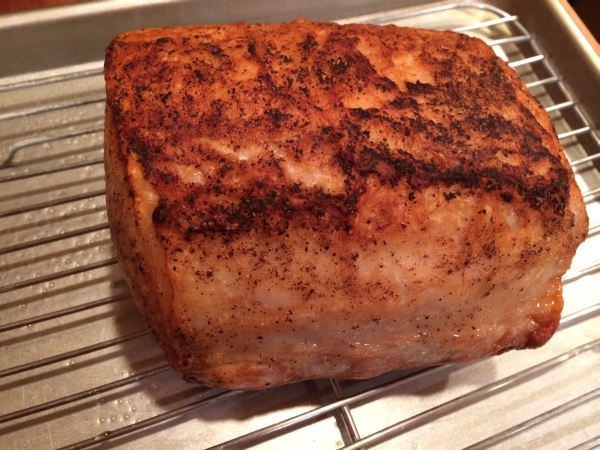 I came across a pork loin center cut roast in the freezer the other day and thought it sounded good. 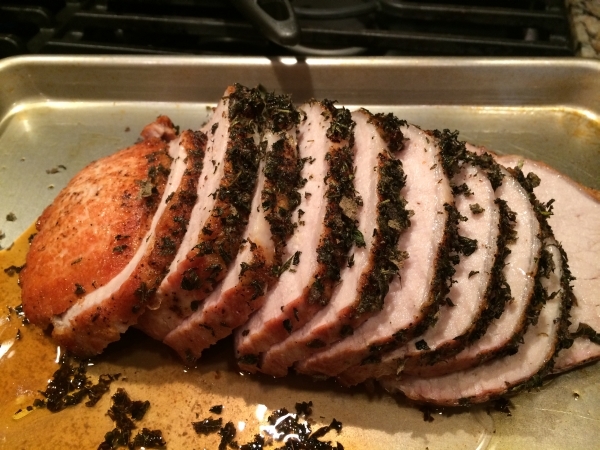 The loin is where we get the leanest and most tender pork cuts. 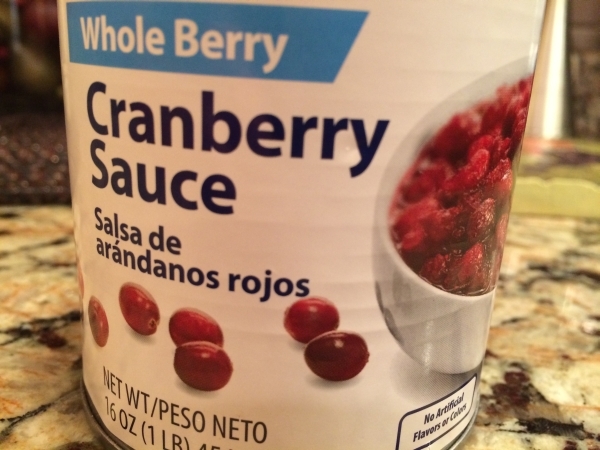 Since they’re lean, these cuts tend to dry out if overcooked. 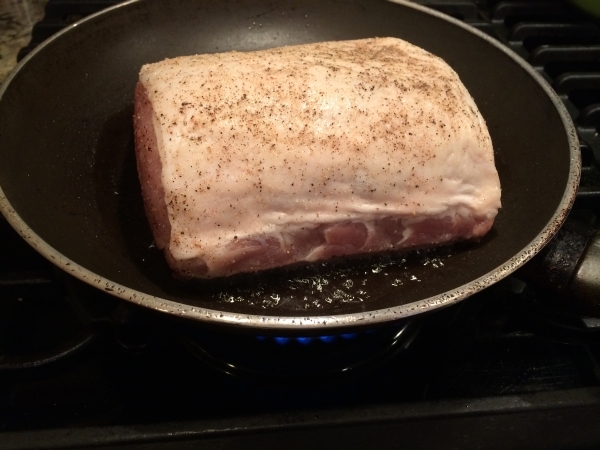 Pork is safe to eat if it’s cooked to an interior temperature of 160 degrees. 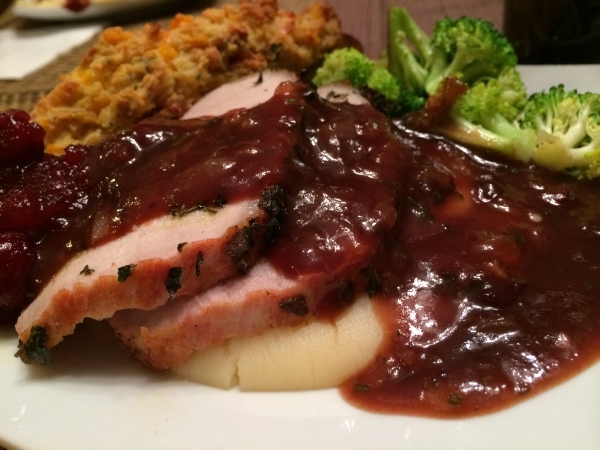 This roast is delicious when brined or rubbed with a spice mixture and went well with the fall flavors of cranberry and rosemary. 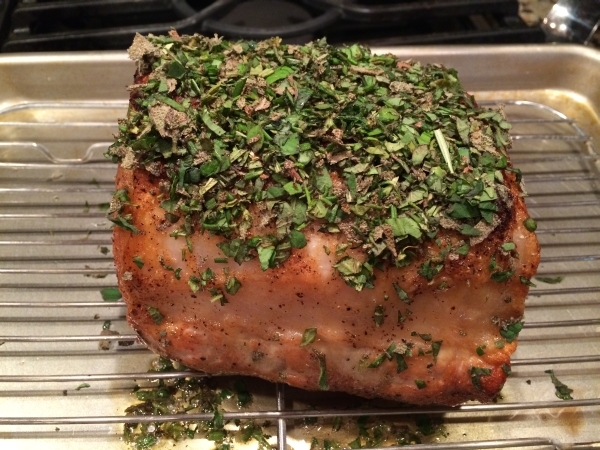 Loin roast can be rolled and stuffed and then tied with string if you’re feeling ambitious, but taste great roasted simply. Loin is sometimes confused with tenderloin. 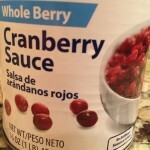 Despite the name similarity, they are not one in the same. 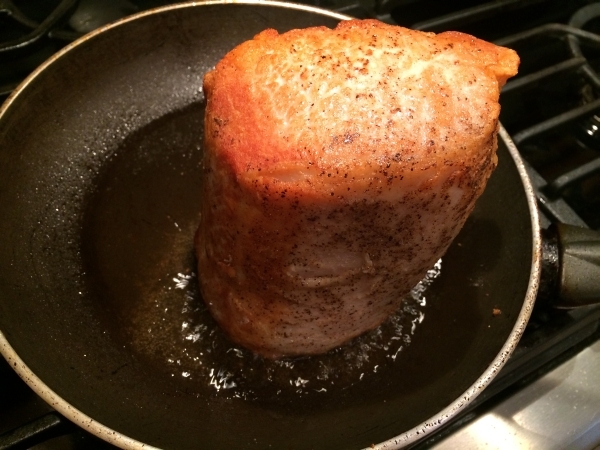 A loin roast is typically sold in pieces weighing between 2 to 4 pounds and the tenderloin is a smaller, long cut that usually weighs about a pound. 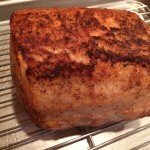 The term roast simply refers to a large cut of pork. 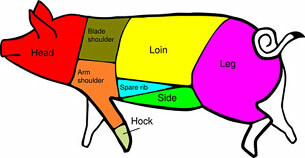 The loin roast comes from the area of the pig between the shoulder and the beginning of the leg It is sold either bone-in or deboned. There are three main parts of the loin: the blade end, which is closest to the shoulder and tends to be fatty; the sirloin end, which is closest to the rump and tends to be bony; and the center portion in the middle, which is lean, tender, and expensive. 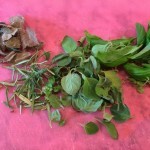 Season the roast with salt and pepper and brown the outside first in a hot skillet in the grape seed oil. 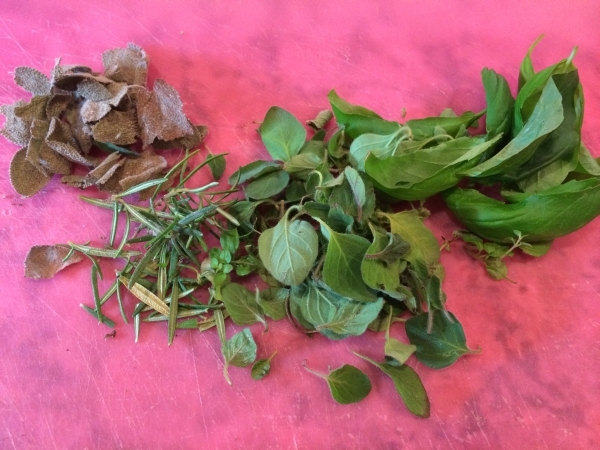 Turn so that all sides get browned. 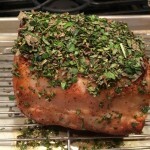 Place the browned roast on a rack, fat side up and top with the chopped fresh herbs. 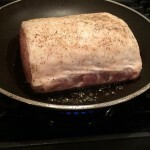 Place the roast in a preheated oven at 350 degrees. 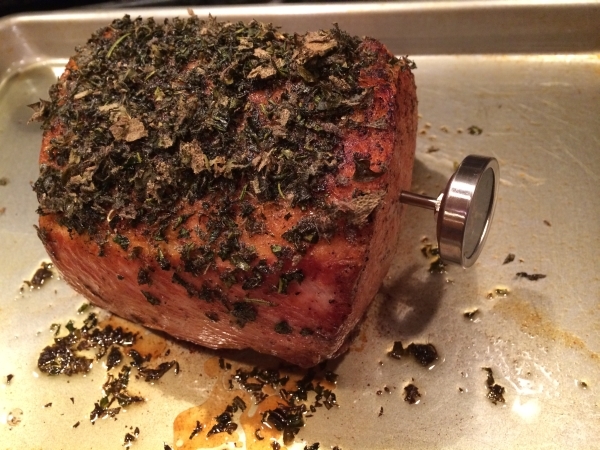 Cook for about 30 to 45 minutes, then start checking the roast’s temperature with thermometer. 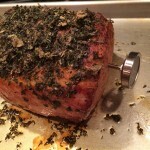 Remove the roast when the internal temperature, measured as deep into the roast as you can get, reads 155 degrees. 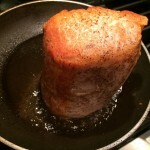 Remove the roast and let stand (tented with foil) for about 15 minutes and until the inside temperature reaches 160, as it will continue to cook before slicing. 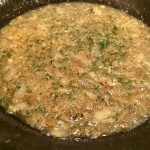 Saute the onion in the oil until it begins to become translucent. Add the chopped rosemary and garlic. 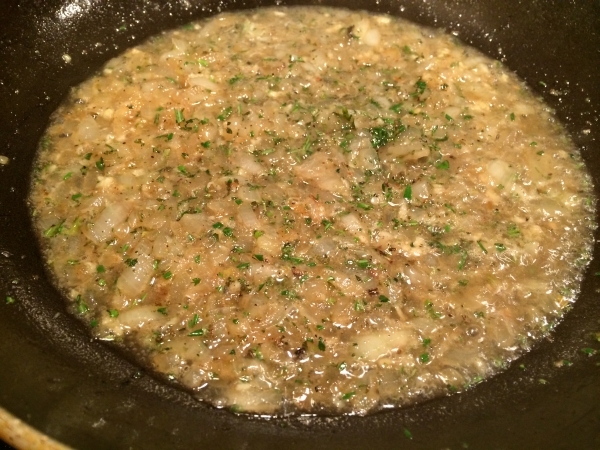 I added a couple tablespoons of water and continued to cook until onions became completely. Stir in the gravy, cranberries and the and balsamic and cook until thickened. 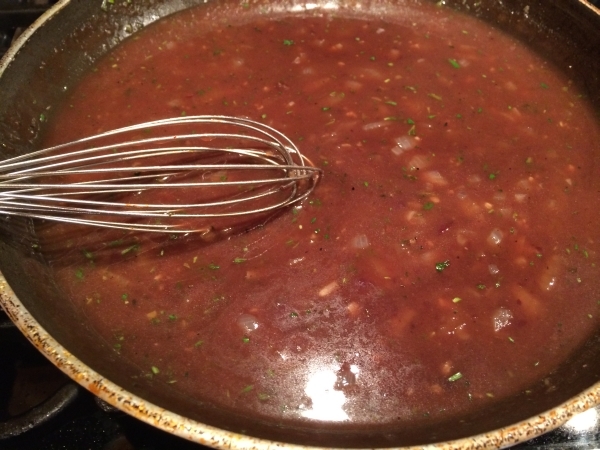 Serve the sauce over the pork slices. We enjoyed the pork with a side of steamed broccoli, mashed potatoes and corn casserole sticks. 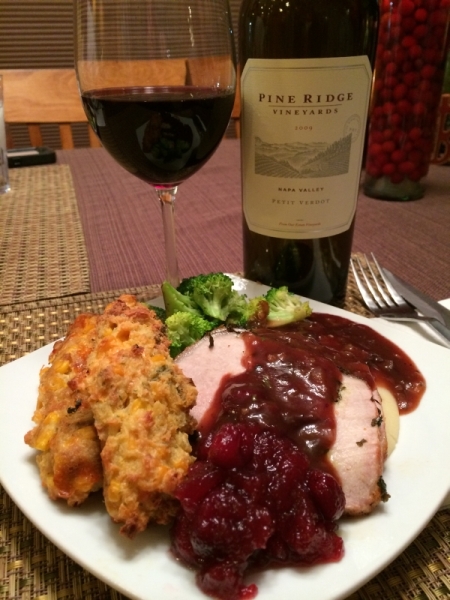 It paired wonderfully with the 2009 Pine Ridge Petite Verdot!